There are a lot of good things about winter, bad hair conditions are not among them. Especially for ladies, your hair suffers during the winter. Winter effect causes split ends to dandruff, we all suffer in one way or another. 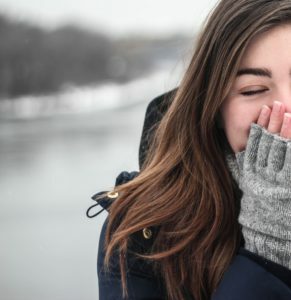 Here are some tips to help you look your best during the cold season! When the moisture outside drops, your hair can become dry and brittle, leading to a weaker appearance. You can fix this by easing up on your hot tools, such as curling irons and hair straighteners. Also, try to add more moisture to your hair by using hydrating shampoos and leave-in conditioners. When temperatures fall, hair tends to static as it gains electrons from the air as there is no humidity or moisture to counteract the energy. To fix this, try to keep moisture in your hair. Try to use hydrating shampoos and conditioners as well as stepping back from your usual hair-dryer. In the winter, the cold weather and lack of moisture can cause your hair to break or “split”. The only way to fix that is to go into the salon for a haircut and keeping your hair moisturized so it doesn’t become brittle and break off again. As soon as winter starts, your hair gets stuffed into the nape of hoodies and jackets. This causes the hair to become matted. The best way to counteract matted hair is to keep it away from the collars of jackets and scarves. Wear your hair up in a braid or bun. Even ponytails can be rocked with a good winter outfit and you can avoid matting! Because of the dry air, your scalp becomes dry. This leads to dandruff and dry skin. A good way to fix this is to use less shampoo and more conditioner. The shampoo usually contains chemicals that dry your hair and take out necessary oils while conditioners add a protective layer to every strand. You can also use medicated brands such as Head and Shoulders to ensure a healthy scalp and hair. For the best look this winter, come into Charisma to get a haircut, conditioner, and style for a great price. The dry winter air won’t be a match for your hair. Set up an appointment and contact us today!